QUINTET.3 Heavyweight Collision Announcement: Frank Mir vs. Satoshi Ishii! QUINTET is very excited to announce an additional special single match to take place on the QUINTET.3 card set for October 5th. MMA and grappling veteran and legend, Frank Mir will take on Judo Olympian gold medalist, Satoshi Ishii, in an explosive heavyweight grappling matchup under the unique QUINTET rule set. 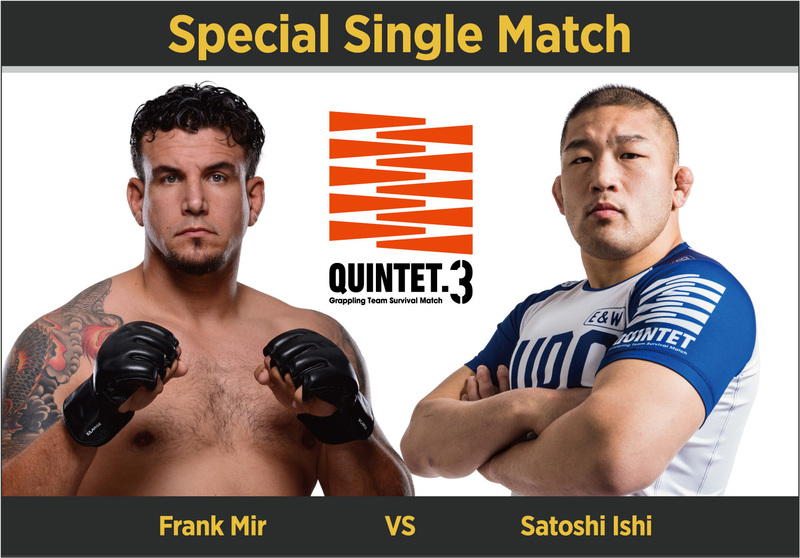 HOME > ニュースリスト > QUINTET.3 > QUINTET.3 Heavyweight Collision Announcement: Frank Mir vs. Satoshi Ishii! QUINTET, already famous for its “winner stays on” submission only rule set, presents a world class heavyweight match up to add to the already aggressive QUINTET.3 card. Special Single Matches are set for 8 minutes, and can only be won by submission in the allotted time period. If there is no winner by the 8-minute mark, matches move to “sudden death” where grapplers have a further opportunity to submit their opponent. Matches continue until the event of a physical/verbal tap out, or 3 “shido” are given. Shido are referee warnings, or cautions, and as in the Team Matches they are given for inactivity or lack of aggression. In our latest announcement adding to the QUINTET.3 Las Vegas show, powerful heavyweights Frank Mir and Satoshi Ishii have agreed to go head-to-head as the most exciting new grappling event of 2018 makes its North American debut. Mir, a former UFC Heavyweight Champion, holds the accolade of the highest number of submission wins in UFC history. Ishii, Beijing Olympics Judo gold medalist and competitor in QUINTET.1 and QUINTET.2, looks to bring his renowned power to the mat at Orleans Arena on October 5th. Under the QUINTET rules, this collision of heavyweight strength coupled with elite technique will be a non-stop feast for combat submission fans’ eyes!